In a new paper in PNAS, Basu, et. al, (2015) induce site-specific gene insertion using both the TALEN and CRISPR/Cas9 systems in Aedes aegypti, utilizing methods that streamline the process for maximum efficiency. Modifying the genomes of mosquito vectors using TALEN/CRISPR systems shows great promise for the development of transgenic strains carrying advantageous phenotypes, such as pathogen resistance. However, an efficient system of heritable gene editing in mosquito vector species has not yet been fully developed. The authors first test previously described variables that have been found to affect the efficiency of inducing site-specific gene editing: (i) the architecture of TALEN FokI nuclease domain, and (ii) the design of guide RNAs (sgRNAs) for the CRISPR/Cas9 system. Using transient embryonic assays followed by detection of germ-line editing, the authors found that the WT FokI domain was most efficient for inducing site-specific double-stranded breaks in Ae. aegypti. The authors then tested the ability of many different sgRNAs to induce Cas9 mutations at the target site and found the most effective did not conform to previous design criteria. However, the best candidate sgRNAs produced heritable mutations in germ-line experiments at a frequency of 24-90%. This approach signals the need to test various sgRNAs before performing CRISPR/Cas9 gene editing in Ae. aegypti. Lastly, the authors describe a method for gene insertion in Ae aegypti via homology-directed repair (HDR) using both the TALEN and CRISPR//Cas9 system. 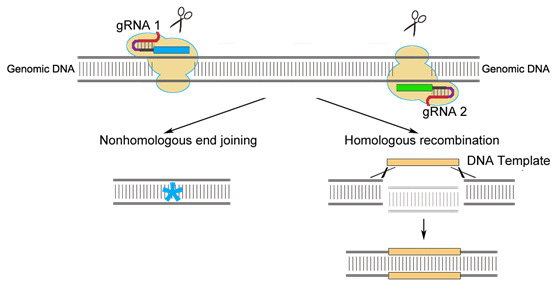 Gene insertion using the HDR pathway is inherently low due to competition with the activity of non-homologous end joining (NHEJ) components. The authors overcame this by using RNAi to temporarily suppress NHEJ activity in early mosquito embryos. Following this, the authors were able to successfully insert transgenes into embryos using TALEN and CRISPR/Cas9 and produce viable adult mosquitoes containing the inserted gene with a transformation rate of 2.1%. Cumulatively, this study demonstrates that both TALEN and CRISPR/Cas9 systems can be used to efficiently produce gene-editing events in mosquitoes and describes strategies to increase the efficiency of these events. Undoubtedly, future work will increase the efficiency of these systems in mosquitoes even more, to the point that even novice investigators may easily and reliably perform gene editing or insertion. The medical relevance of this study is key and there is a good chance that the successful introduction of pathogen-resistant mosquitoes into the environment to control malaria or dengue will utilize the methodology outlined in this publication.